This unusual name is of Anglo-Saxon origin, and is a locational surname from any of the various places that get their name from the Olde English pre 7th Century "hoesel", hazel, plus "-denu", a valley, for example Heselden in Durham, and Hasselden in Sussex. Locational surnames were usually acquired by a local landowner, or by the lord of the manor, and especially by those former inhabitants of a place who had moved to another area, and were thereafter best identified by the name of their birthplace. The surname from the former source is first recorded in the mid 13th Century (see below). One Alexander de Haselindene appears in the 1258 Records of the Abbey of Kirkstall, Yorkshire and a Reginald de Haselden appears in the 1275 Hundred Rolls of Wiltshire. 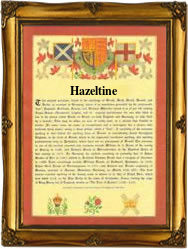 In the "modern" idiom the name has at least twenty-five spelling variations, including Hazelden(e), Hazeltine, Hazeldine, Hazeldeane, Haseldine, and Haizelden. William Hazeldine (1763 - 1840) was an ironfounder who supplied ironwork for the Menai and Conway bridges in Wales (1819 - 1826). The first recorded spelling of the family name is shown to be that of Robert de (of) Heseldene, which was dated 1243, witness in the "Assize Court Rolls of Durham", during the reign of King Henry 111, known as "The Frenchman", 1216 - 1272. Surnames became necessary when governments introduced personal taxation. In England this was known as Poll Tax. Throughout the centuries, surnames in every country have continued to "develop" often leading to astonishing variants of the original spelling.